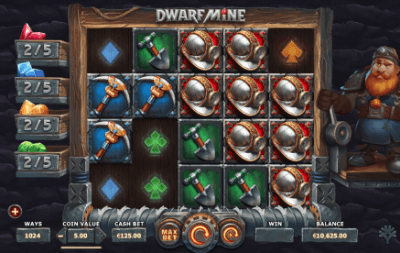 Dwarf Mine - Many producers of slots for online casinos continue to delight all fans of gambling from around the world. And the first month of spring is no exception. In March of this year, the mass of interesting online slots is already out and will be released. Today we would like to tell you about the slot of the Yggdrasil Gaming company, which will soon be available for playing in an online casino. This slot is called Dwarf Mine. As you can already guess from the name, the plot of this slot is built around a hard-working gnome who constantly descends into the mine with precious stones in order to get them as much as possible. If you like the theme of treasure hunting, then you it is impossible for you not to play this slot. Just pick up a shovel (figuratively speaking) and go in search of treasure. And there are a lot of them in the bowels of the earth's crust. In general, the playing field during the whole time is limited by the boundaries of the underground mine itself. In such a situation, the player can see 5 reels with 4 symbols on each screen, and can also use 1024 winning lines. But the situation may change at any time, and bonus symbols may appear on the screen, which entails the expansion of those playing reels with special hydraulic pistons. And in this case, they will not be shown 4 rows of symbols, as usual, but 7. In this game mode, the player can win big money with the help of 16,807 lines. If during the game 3 identical bonus symbols appeared on the playing field, the player is waiting for a bonus in the form of 10 free spins, but the player will get it only if there are 7 rows of symbols on the screen instead of 4. There is another type of bonus free spins. Its essence lies in the fact that you need to accumulate precious stones in the boxes to the left of the reels, and if you manage to accumulate 5 stones of the same color, you will receive 5 additional rotations for each set of stones. We should say in conclusion of this review that if you are a real gambler and feel the strength to win a big cash prize, then hurry up to be the first to succeed in this slot. You have all chances for it, as Dwarf Mine slot offers players the maximum jackpot (not progressive), which is 3,904 times the amount of your bet per spin.